I was visiting the “Rubel Castle” today in Glendora, California, and found this! The site was the home of a man, Michael Rubel, who for 25 years built a home that was as much creative expression as it was a hoarders delight! Throughout the years, countless people helped in the construction and enjoyed a place of commiseration and varied endeavor. 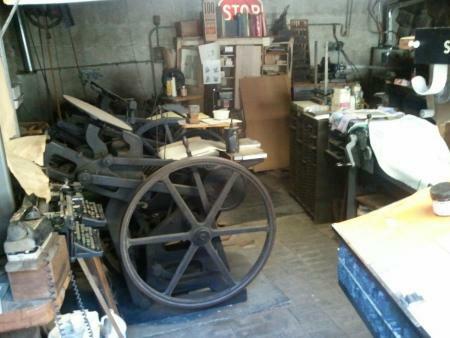 The print shop has two overhead shaft driven 10 x 15 C & P’s (1916 & 1925), a Vandercook and everything else needed in a space all crazily compressed. I looked around and thought, “Heck, what a mess - just like mine!” Judging by its actual cleanliness and and a lack of vermin, it must have been used up to fairly recently. Very interesting and appealing to all of you with a Bohemian heart! Here is a link to these presses being used in situ. The “Kingdom of Rubelia” was mentioned in John McPhee’s California chapter in “The Control of Nature”, mainly because Rubel built the castle with stone delivered to him by the debris flows out of the San Gabriel mountains, which were the subject of McPhee’s story. He did say that Rubel had a printing shop among the many crafts practiced at the castle. Fun to hear that it’s still there, though I gather Rubel isn’t. Re: McPhee - I live in Altadena and am intimately familiar with foothill living and its travails as outlined by McPhee! Living, working and playing on an alluvial fan is bad enough. However, there is so much cable, rebar and railroad steel in that structure as to probably make it safer than most structures around here. He passed in 2007, but the place is a-crawl with those who knew and cherished him! 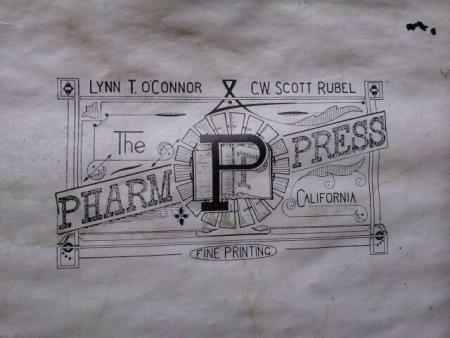 Here is a little treasure that is still pinned to the door of the Rubel “Pharm,” Castle & Print Shop! Thanks, duffmo. I’m often in the Pasadena area and this looks like an interesting place to visit. I have to mention something, though. When I saw the Flickr photo, I shuddered to see Lynn O’Connor’s pigtail so close to whirling, clamping machinery. A reminder to tie up long hair! I was just googling for scholarly writings on Rubel Castle because we are applying for National Historic Status and was reminded that McPhee wrote about us back then. So I googled “McPhee Rubel Castle” and, coincidentally, our Briar Press was the number one hit! I sure miss having my old business card with my fun line drawing on it. But, alas, business for Pharm Press never took off, and my current with the boring logo does much better by comparison.